The project was carried out in collaboration with AECOM and includes the exterior for the new practice facility for the arena. The building mediates between the existing city grid and the new arena, surrounded by the large public space that has been created for it. The design reflects the importance of the practice courts, offices and ancillary spaces for the team. Its scale and proportions provide a civic presence and public face for the functions. Since the building is normally viewed obliquely when travelling down the street, it was important to create a form that had a sculptural depth when viewed from the sides. Due to the site constraints there was little space to play with to create a deep façade. This was a solved by surrounding a long band of windows with a gently sloped framing element, which exaggerates the three-dimensional form of the facade when viewed at a steep angle. The team meeting room is expressed in the rectangular form of a bay window that projects through the window band and is held by the upper and lower solid frames. The composition creates a sculptural grouping within a shallow depth. 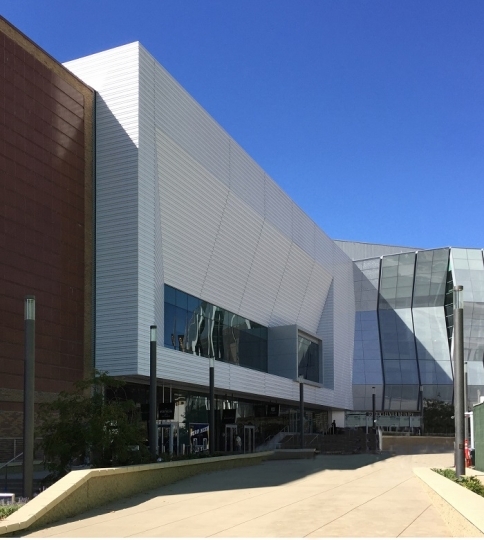 The upper portion of the facade is solid to conceal the large air conditioning units required for the arena but the sloped framing elements animate this wall. Clean lines and sheer size of the facade and create a form that is monumental in scale. The building appears to float above a glass base at street level, which contains the team store, entrance to the offices and the players’ entrance.